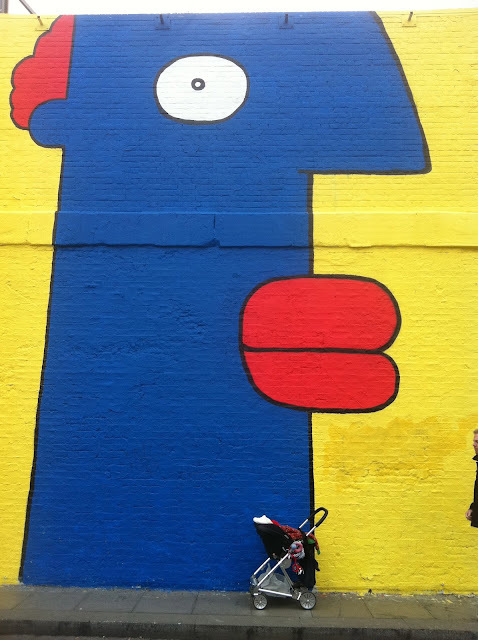 I had to share this photo of Eli in his buggy in front of a wall in Shoreditch. I'm really trying to get out and about with Eli now, as I find I go a bit nuts if I don't leave the house for a whole day! I remember the first day I pushed him in the buggy, my partner dropped me off outside a restaurant in the car, as I wanted to see my girls from work before Christmas- Eli was 10 days old. I had to push him up a few steps into the restaurant and along to the table and it felt so strange...It wasn't me at all! I felt like I was some sort of impostor pretending I had a baby!! I struggled to get in through the door with one hand. Anyway we had our lunch and Eli slept all the way through, and woke just as we were leaving- I was terrified of breast feeding him in public (thankfully I've gotten over that fear now) so I practically ran home with him screaming. v. stressful. Looking back now I feel I have come a long way- I'm not so terrified and Eli is used to my rather erratic driving! This buggy was gifted to us by Mamas and papas- it's the Urbo and we're still using it with a car seat which means it's super neat and compact, and very robust so can handle a few bumps! Thanks for sharing this Donna. I only just discovered your blog after picking up one of your beautiful baby blankets for my new baby son. I too have just made that leap and realised my confidence in taking him out by myself has grown. I remember the first time I did it was terrifying. It reminded me of the first time I drove a car by myself! I am still no pro but its good to hear other mums have similar experiences!